My book, Password, is out now! My short book in the Object Lessons series, Password, is released today, published by Bloomsbury. It’s available to buy in all the usual places. All author royalties will be donated to Arthritis Research UK. When I first saw the Object Lessons series, I felt I wanted to write something for it. 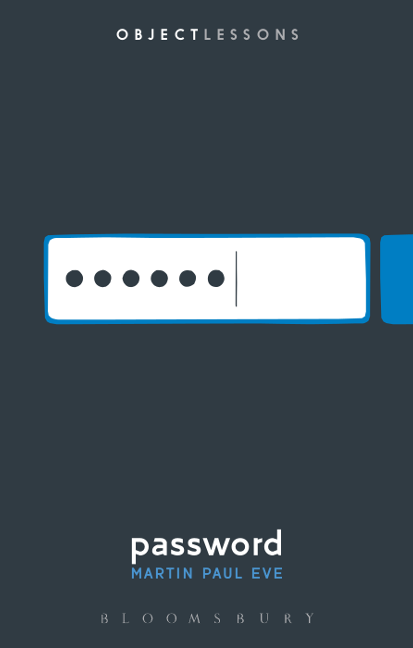 It wasn’t, originally, going to be Password, though. I initially suggested “trade” as the subject. Then, when the editors thought that more appropriate for a short essay, I gave them a list of topics that interested me: rocket, crossword, password, light bulb, frame. They picked password! I still think crossword would have been a good book. In particular, there’s a great historical story about moral panic around crosswords in the 1950s or so. Indeed, watch the well-known film, Brief Encounter, to see how this works. The wife sneaks out for her meetings because her husband is at home, doing the crossword, ignoring her. Much as people blame mobile phones today, the crossword had a far earlier moral panic attached about the breakup of the nuclear family. But the book I did write, Password, is something of which I remain proud. It tackles the problems of identity that passwords are meant to solve, even when they always fall short. It travels from Ancient Greece, through Roman encampments, via Harry Potter and Hamlet, into the future worlds of Minority Report and Demolition Man. Enjoy! My book, Password, is out now! was published on July 28, 2016 . You can annotate or comment upon this post.